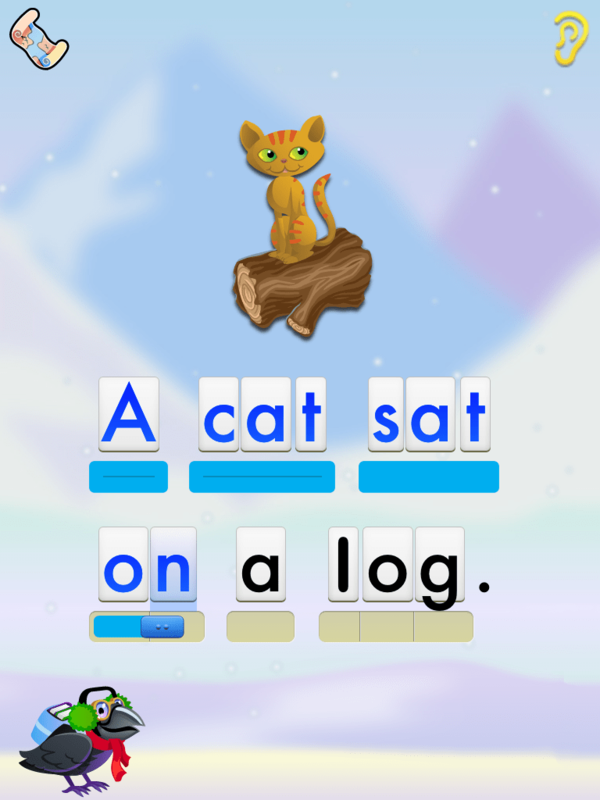 Reading Raven HD is an interactive phonics-based app designed to help children aged 3-7 years old learn to read. It is available in iPhone and iPad versions, this review is of the iPad version. 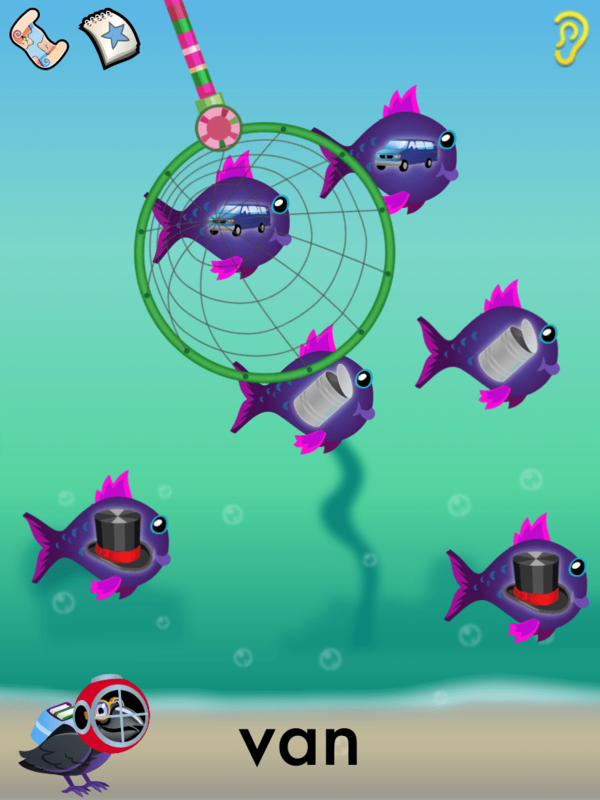 It includes 3 levels of activity, you can choose to work on one, two or all three of these levels, or choose only the activities you want from any of the levels. You also have the option to work in normal (Abc), uppercase (ABC) or lowercase (abc), and to choose which of four font styles to use. The settings are child-proofed – you have to answer maths questions to access them. 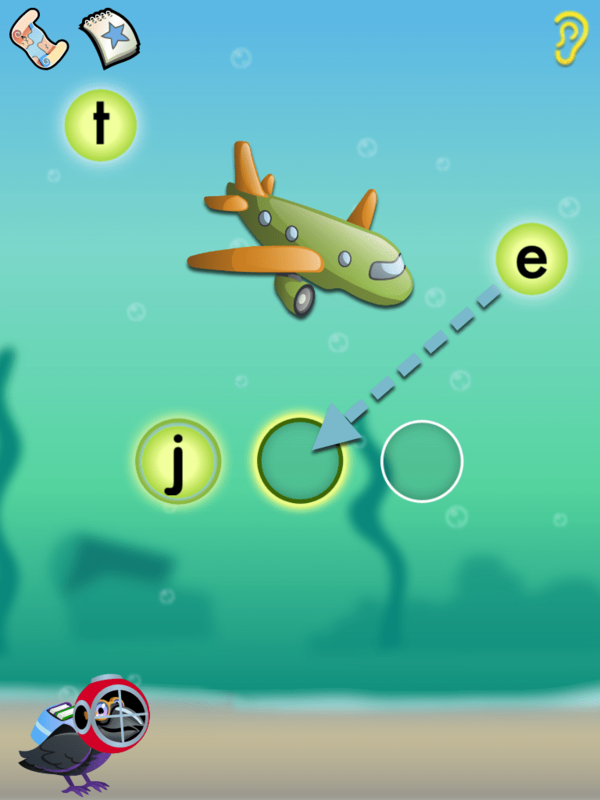 There are five lessons included in the app, each working on a group of five letters (individual letters, plus words that start with those letters). All letters except Q and X are covered, Th is also included. The words are 1-4 letters long and the sentences are 2-8 words long, some sight words and punctuation marks are also introduced. Each lesson has it’s own theme e.g. it occurs underwater or in the snow or in outer space. Reading Raven is the child’s guide throughout the app, he is a cute bird who wears a scarf and glasses and carries a backpack . The child earns stickers as a reward for doing the activities, and uses these to decorate Reading Raven’s tree house. The stickers illustrate the words the child has learned, touching them makes the written word appear and be spoken, further reinforcing what has been learned. Age 3+: Letter matching, letter recognition, letter tracing, and word matching. Age 4+: Vocabulary, word beginnings, word spotting, word building. Age 5+: Reading aloud (with recording and playback), word tracing and word groups. Letter Matching: a letter falls e.g.from a flying bird or a ski lift, and the child has to match it to the same letter below. As it falls they hear the letter sound, once they correctly match it they hear the letter name, sound and a word beginning with that letter. Letter Recognition: the child hears the sound of a letter and identify which letter (of several) makes that sound. Letter Tracing: the app shows the letter outline and the correct order to make the strokes, and the child then traces the letter. 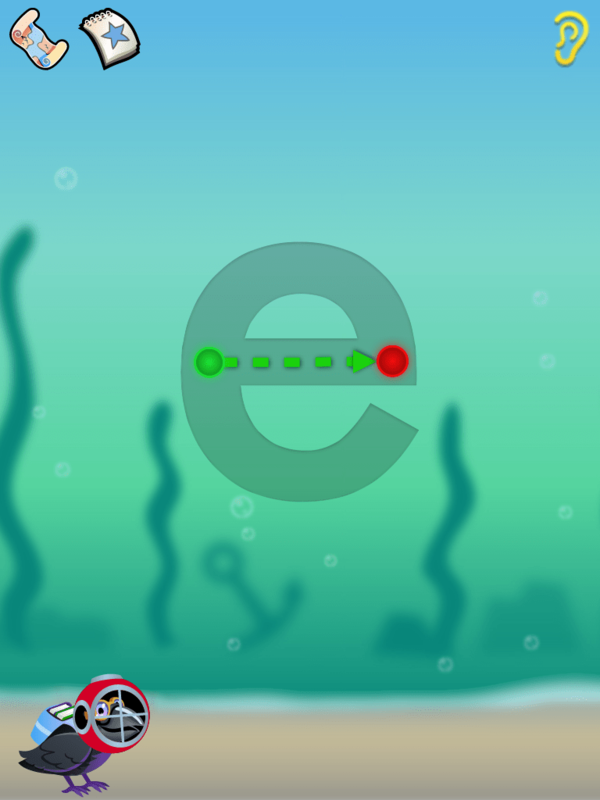 The app allows them to go outside the lines, but they do need to touch dots at the start and end of each stroke. When they finish the outline disappears and you see how they wrote the letter. Word Matching: this is similar to letter matching, but instead of letters, words starting with the target letters fall down and have to be matched to identical words below. 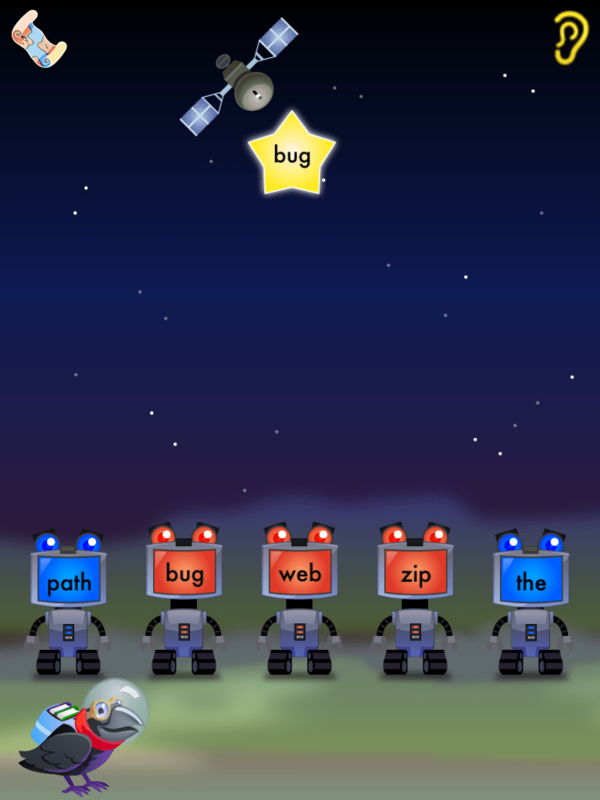 4+ Level: In this level the child builds on their skills from the previous level and start to read simple words. 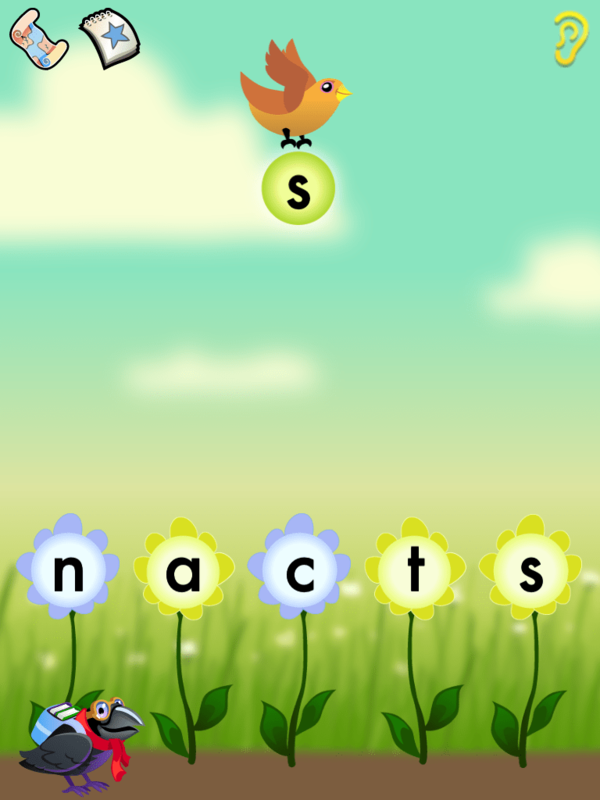 Word Beginnings: this is similar to the letter matching in the 3+ level, but this time they must match the falling letter to a picture of a word that starts with that letter. Vocabulary Building: the child hears (and sees) a word and must match it to a picture of the word. Word Building: the child has to put the letters together in the right order to make a word. Word Spotting: the child hears a word and must pick the written word (of several) that matches it. 5+ Level: In this level children practice reading and writing. Reading Aloud: the child practices reading short words, then moves on to short and then longer sentences. As the child reads they move their finger along a bar under the words and their voice is recorded and played back to them. Word Tracing: this is similar to the letter tracing in the 3+ level but they move on to writing words. 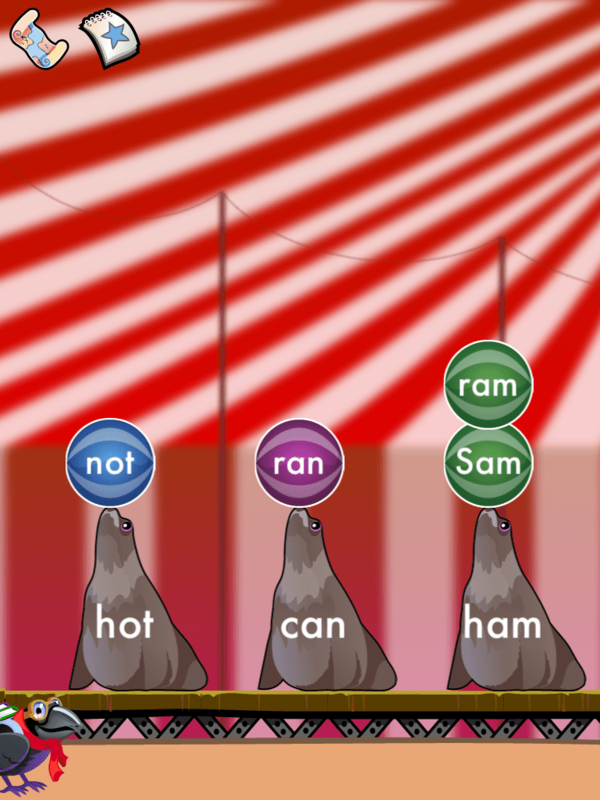 Word Group: activities practice recognizing words that start or end with the same sound and teaches rhyming. I have used this app with my five year-old- twins and really like how flexible it is. I like being able to start out including some concepts that the child already knows for reinforcement, and then removing them later as their skills improve. 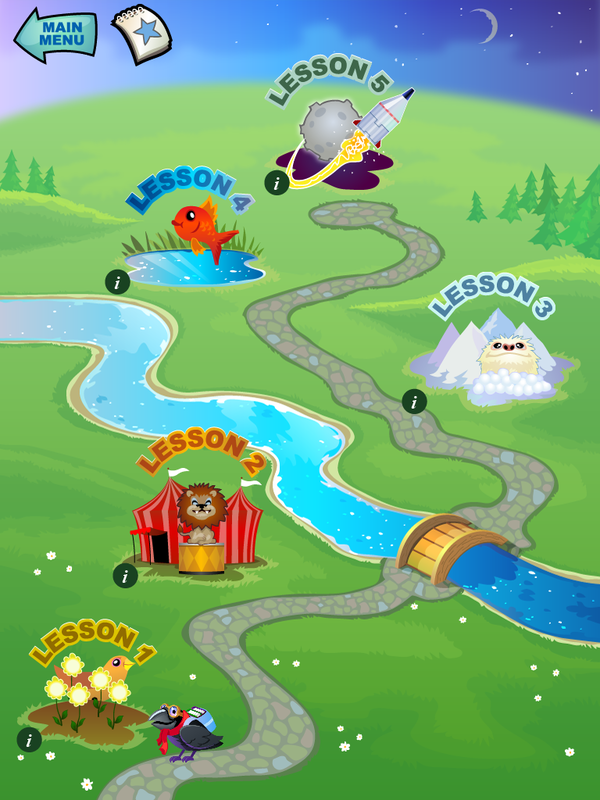 I also like that you don’t have to do a whole lesson at once, it is really easy to just do as much or as little as the child wants to do and the app remembers where they were. The app covers a lot of material for learning to read – from letter and sound recognition, through reading simple words up to reading sentences, and also for practicing writing at the letter and word level. It is engaging too – the first day we used the app my daughter said “mummy can we use this every day?”, and she is still enjoying using it. She also loves to collect the stickers and decorate the tree house. One thing I would like to see added at a future update is the option to have multiple user profiles- so if you are using it with more than one child it can save their individual settings and progress. 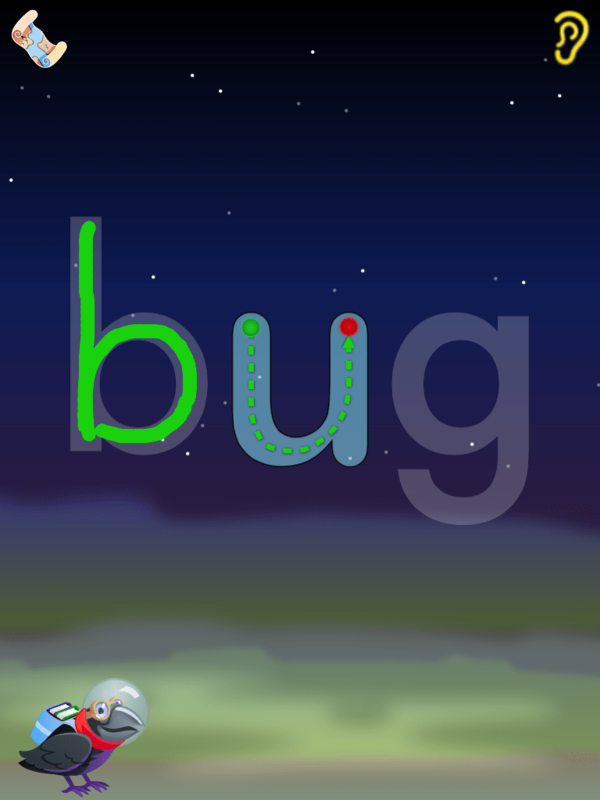 Overall, this is a great educational app for pre-school and early elementary school students. Its illustrations are bright and colorful, it includes animations that enhance the learning experience and a child’s voice encourages them to keep playing and try again when they make mistakes. It covers a lot of material in a fun and engaging manner. For the quality of the app and he amount of material it contains it is a great deal for $3.99, highly recommended. You can find out more about the app and watch a video of it in action on the Reading Raven website. Reading Raven HD : Requirements: Compatible with iPad. Requires iOS 3.2 or later. Reading Raven: Requirements: Compatible with iPhone, iPod Touch and iPad. Requires iOS 3.2 or later. If you would like to win a promo code for this app, please enter via the Rafflecopter Widget. Winners must contact The iMums within 48hrs of the winners being announced to claim their prize. This giveaway is open to everyone, worldwide, and an iTunes account is required to claim the prize. Good luck! A fee was received to expedite this review to the top of our waiting list but this payment has not influenced the objectivity of the review and all opinions have been offered honestly. I really like apps that are versatile and can be customized. This would be a great addition to my literacy apps for use with my speech/language therapy students. I just got the link to this review from iteach special education group. It is exactly what I am looking for! This would be helpful for my son who’s just beginning to read! Thank you for your thorough review and endorsement! We love to hear how Reading Raven is received. We are busy at work on the next lessons to keep our little readers advancing. This sounds like a great app because of the flexibility and tools in removing and allowing prompts to improve skills. Though I have quite a few book apps, this would make an excellent addition to add to my collection and will give my students the best opportunities for learning. We don’t have many reading apps, so this would fill in a gap in our collection. THanks for the chance to win! The iMums sent me here. The flexibility of the app would be an asset to my collection as I work with elementary students as an SLP. The students I work with are working on skills ranging from letter identification and letter sounds ranging through reading comprehension of complete and complex sentences.